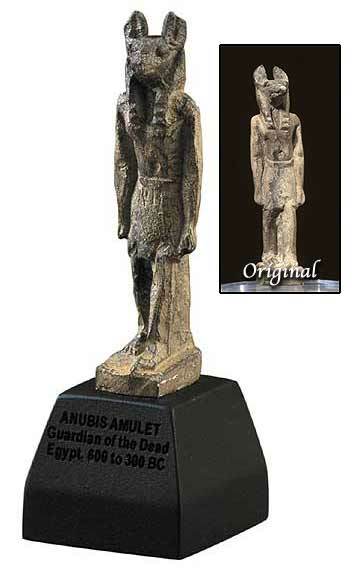 Size: 5" x 2" x 1.75"
Anubis Amulets, such as this exact copy of a 2500 year old original, were worn by high and low-born alike, since all Egyptians were concerned about safely reaching the afterlife. 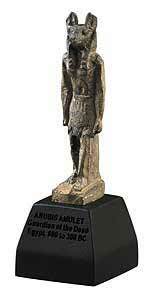 Anubis, the jackal-headed god, discovered embalming and mummification and was the link between the living and the dead. As "keeper of the dead", he assisted in the rites by which a person was admitted into the underworld by weighing the heart against Truth to determine the worth of the person's life! To fail this test meant oblivion. An important god, he carried the scepter of the rulers in his right hand and lasted through the 3000 years of Egyptian civilization.